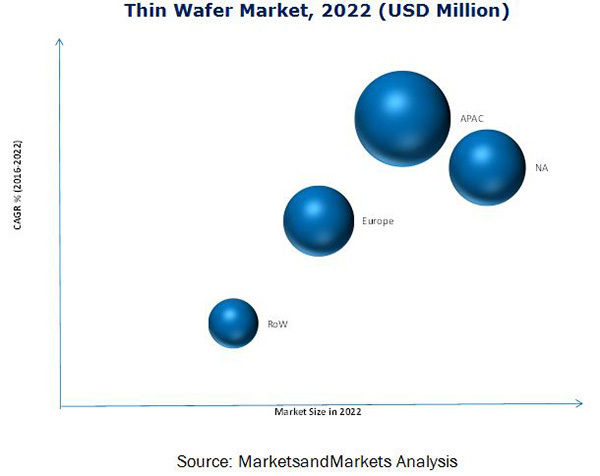 The thin wafer market was valued at USD 6.76 Billion in 2015 and is projected to reach USD 9.17 Billion by 2022, at a CAGR of 3.7% between 2016 and 2022. The base year considered for this study is 2015 and the forecast period is from 2016 to 2022. This report provides a detailed analysis of the market on the basis of wafer size, application, and region. The 300mm wafer segment is estimated to account for a large share of the thin wafer market; this segment is expected to grow at the highest CAGR between 2016 and 2022. 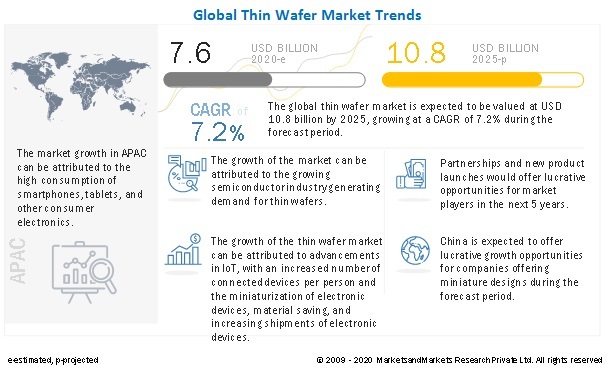 The research methodology used to estimate and forecast the thin wafer market began with capturing data on key vendor revenues through secondary research. The vendor offerings were also taken into consideration to determine the market segmentation. The bottom-up procedure was employed to arrive at the overall market size of the global thin wafer market by determining the revenue of key players in this market. After arriving at the overall market size, the total market was split into several segments and subsegments, which was later verified through primary research by conducting extensive interviews with key personnel such as CEOs, VPs, directors, and executives. The market breakdown and data triangulation procedures were employed to complete the overall market engineering process and arrive at the exact statistics for all segments and subsegments in this market. This report provides valuable insights regarding the ecosystem of this thin wafer market, such as product manufacturers and suppliers, OEMs, system integrators, suppliers and distributors, electronic device manufacturers, and semiconductor device manufacturers. This study answers several questions for stakeholders, primarily which focus on prioritizing efforts and investments in this market, in the next two to six years. Key players operating in this thin wafer market are LG Siltronic, Inc. (South Korea), Shin-Etsu Chemical Co., (Japan), Siltronic AG (Germany), SUMCO Corporation (Japan), SunEdision Semiconductor Ltd. (U.S.), SUSS MicroTec AG (Germany), Lintec Corporation (Japan), DISCO Corporation (Japan), 3M (U.S.), Applied Materials, Inc. (U.S.), Nissan Chemical Corporation (Japan), Synova (Switzerland), EV Group (U.S.), Brewer Science, Inc. (U.S.), and Ulvac GmbH (Germany). This research report categorizes the global thin wafer market based on wafer size, application, and region. The thin wafer market was valued at 6.76 Billion in 2015, and is projected to reach USD 9.17 Billion by 2022, at a CAGR of 3.7% between 2016 and 2022. The increasing demand for semiconductor devices in varied industry verticals such as automotive, consumer electronics, and telecommunication, among others, serves to be one of the most significant factor propelling the growth of the thin wafer market. Thin wafers have applications in LEDs, MEMS, CIS, power devices, RF devices, memory, and other semiconductor devices. In addition to this, the growing IC industry and high adoption of portable devices are creating opportunities for thin wafers worldwide. The memory application accounted for the largest share in the thin wafer market. This large share is attributed to the growing usage of memory devices in computers, laptops, digital music players, gaming devices, and mobile internet devices. The 300mm wafer segment is the fastest-growing segment in the thin wafer market. The 300mm wafer offers the ability to manufacture a large number of devices in a single batch. This is one of the prime reasons companies are developing their semiconductor devices by using this wafer. For instance, in 2011, Infineon Technologies (Germany) started developing power semiconductor devices by utilizing this thin wafer market. The Asia-Pacific thin wafer market is projected to grow at the highest CAGR between 2016 and 2022. This growth is attributed to the development of semiconductor devices in economies such as China, South Korea, and Taiwan, among other countries in this region. In addition to this, cheap labor costs and high demand of consumer electronic devices are also propelling the growth of the market in the Asia-Pacific region. North America accounted for the second-largest share of the global thin wafer market. Several companies have their headquarters in the U.S. In addition to this, government support in the U.S. is propelling the growth of the semiconductor industry, thereby becoming one of the major factors influencing the demand of thin wafers in North America. One of the key restraining factors in the thin wafer market is efficiency maintenance. A thin wafer has a low absorption capacity for a long wavelength, especially if the thickness is below 50μm. This inability to absorb long wavelengths impacts its efficiency. Moreover, delays in supply of thin wafers due to manufacturing defects can cause additional losses in the form of order cancellations and shift in customer preference. Key players in this market are focused on mergers & acquisitions and new product launches to increase their revenue. Shin-Etsu Chemical Co., Ltd. is one of the market leaders in the thin wafer market. The company adopted mergers & acquisitions as a key growth strategy to cater a large number of customers and increase its revenue in market. For instance, the acquisition of Asia Silicones Monomer Limited (Thailand) helped the company enhance its sale for silicon end products in other Asian countries. 12.3 Shin-Etsu Chemical Co., Ltd. Figure 41 SWOT Analysis: Shin-Etsu Chemicals Co.